Francis Thomas Duffy was born on August 16, 1923, to Frank and Katie Duffy as one of six children raised in New York City. He enlisted in the United States Marine Corps on August 4, 1942, and attended recruit training at Parris Island, S.C., and received follow-on infantry training at New River and Camp Lejeune, N.C.
Mr. Duffy sailed with the 2/25 from Norfolk via the Panama Canal bound for San Diego to undergo training for the Pacific campaigns at a small tent camp at Las Pulgas Canyon, on the northern fringe of Camp Pendleton, CA. He sailed with the 4th Marine Division for the Marshall Islands on January 13, 1944. This was the only Marine Corp division to sail directly into combat from the United States. Mr. Duffy participated in the landings at Saipan, Tinian and Iwo Jima. At Iwo Jima, Frank was serving as a Runner for the Commanding Officer of the Second Battalion, Twenty-fifth Marines, Fourth Marine Division when a group of the enemy attacked the observation post personnel with hand grenades from a concealed position, Private First Class Duffy unhesitatingly advanced alone and despite being wounded by grenade fire, succeeded in annihilating two of the Japanese. 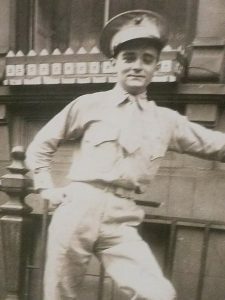 He was awarded the Silver Star for “conspicuous gallantry and intrepidity” for his actions and would spend a year in various naval hospitals recovering from the wounds he sustained until he was finally discharged on February 13, 1946. After the war, Mr. Duffy was employed by the U.S. Postal Service and retired in June 1979. He and his wife, Bridie moved to Pearl River, N.Y. in January 1969, where they raised their six children. Mr. & Mrs. Duffy have ten grandchildren and seven great-grandchildren. They are also members of St. Margaret’s Church in Pearl River. Mr. Duffy has been a member of the American Legion Post 329 in Pearl River since 1981 and is a member of John Cardinal D’Alton AOH – Division III in Pearl River, receiving his major degree in 1977.